Sean returns from losing his leg to run in track meet in this Detroit Free Press photo. If you have not heard the story of Sean English before, sit back and take a minute to take all of this in. Once you read this condensed version, you’ll know why The Michigan Pedaler is participating in a fundraiser this Saturday for Sean and also providing an opportunity for anyone willing to purchase a ride on The Michigan Pedaler for an additional fee, the chance to send $500 towards offsetting the college expenses of Sean. But first, the background for those who have not heard of Sean. On April 2, 2017, Sean and his family were driving on a freeway in Detroit on a Sunday morning. As they turned the corner of the freeway, they saw an accident had happened. Instead of staring and continuing to move, they pulled over and stopped, trying to rescue passengers from the car. In another car, a doctor stopped to do the same thing. While all of this was happening, another car came around the curve. That is when Sean’s life would change forever. It rammed into the accident. When all was said and done, the doctor lost her life and Sean stared at a life very different from the one he had early that Sunday morning. Sean’s life was spared but his leg was not. 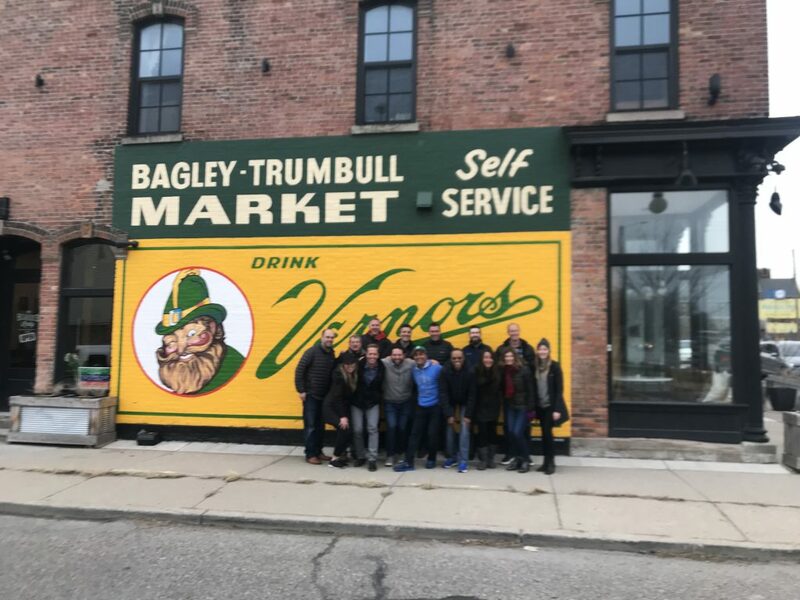 Now, the star and avid cross country and track runner for U of D Jesuit High School, on Seven Mile Road in Detroit, had a journey no one could have predicted. His future, including a cross country scholarship to Purdue University in Indiana, disappeared. The next few months were a whirlwind of activity – recovery from the accident, to multiple surgeries, to being fitted for a prosthesis, to learning to walk, to learning to run, to the fun of senior year, to the chance to run in one last track meet, to graduation – and now onto college. That last paragraph is probably best suited for a book to tell the story completely. But Sean stood up. He stood tall. He never complained. He noted that many people have worse situations than his own. He spoke to other groups to provide inspiration from his story. To see and learn more about this whole process, click this link. You’ll see a number of stories featured on WDIV that include when Sean took his first steps, runs for the first time, and receives a new blade. Sean English lost his leg trying to help others. Now, the community is raising money to help offset his college expenses. (Photo from Sean’s Facebook page). 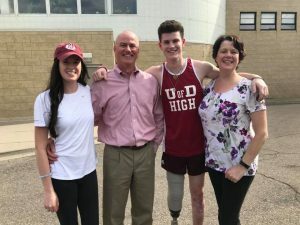 The culmination of the story came in May when Sean ran in the final home meet of U of D Jesuit’s season. This dramatic happening was documented in a Free Press article titled “Heroic amputee Sean English runs final U of D track meet” (Also, main photo is from The Detroit Free Press). But with so many surgeries, his parents spending so much time away from their jobs to travel with Sean out of town as well as to many local hospitals, and the loss of his cross country scholarship, there’s a need to now repay not only the help Sean provided initially, but the inspiration he has provided the entire Metro-Detroit community. It is why a group of people came together to organize a fundraiser for Sean’s college expenses before he departs for college on Monday. This Saturday, August 11th, from 3pm to 8pm, the Ferndale Elks Lodge, located at 22856 Woodward Avenue, will be the site of a fundraiser for Sean English. The Michigan Pedaler is proud to be a sponsor for this fundraiser. 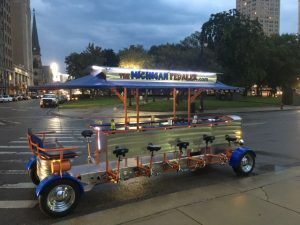 You can win a ride on The Michigan Pedaler as well as some nifty pint glasses, Michigan Pedaler Morning After Coffee and more. Numerous other organizations incuding The Pistons, Tigers, Detroit City are donating items. You can even win lunch with Detroit News columnists John Niyo and Bob Wojonowski. Please stop by and spend a few minutes wishing Sean well and support this local hero. 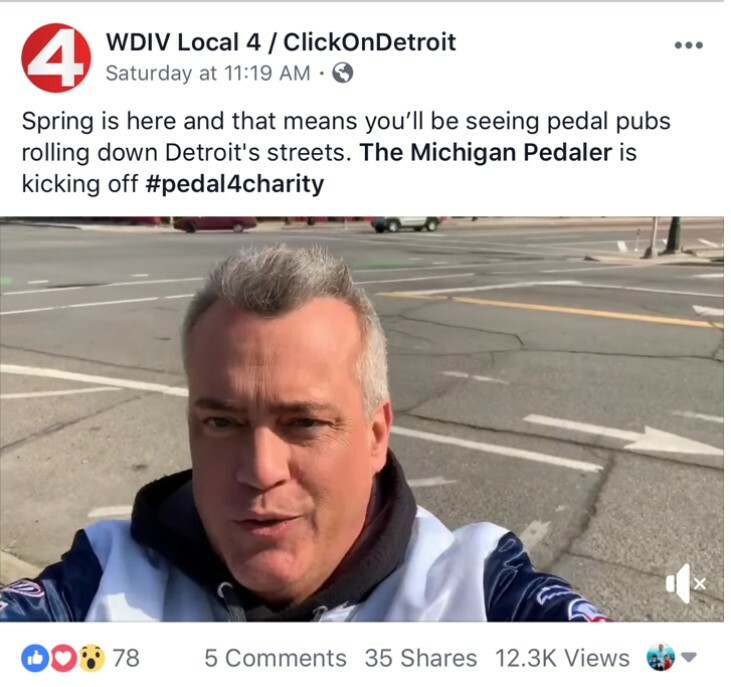 In addition to having the chance to win a ride at Saturday’s fundraiser, anyone willing to pay $500 for a ride on The Michigan Pedaler, our company will donate 100% of the cost towards helping Sean. For complete information on the fundraiser, look at the Facebook page for this fundraiser. Sean English didn’t ask for what happened to him when he willingly tried to help another person in need. In the process he taught young and old a lot of lessons about caring for others, helping others, and showing perseverance in the face of adversity. Now, it is time for the rest of the community to say thank you.